Like the Chicago anarchists of 1887, the beheading of two anarchists at Changsha in Hunan in southern China in 1922 had many repercussions, not least in stiffening the resistance of the emerging revolutionary movement. Unfortunately many facts have been obscured by the fact that Mao Zedong was involved in the events around the Changsha killings and so many accounts from Chinese historians are very much focused on his unerring infallibility and uncanny ability at being at the centre of events, in line with the hagiography that has been manufactured around the Great Helmsman. Both the two murdered anarchists, Huang Ai and Pang Renquan, were two young men who had taken advantage of the technical education introduced into China in the 1910s in order to create a layer of technicians in industry. Huang Ai was born in 1897 at Changde in Hunan. He graduated from the Jiazhong First Industrial in Changsha and then studied in Tianjin. Here he was swept up in the May 4th agitation that started in 1919. He became a delegate of the Tianjin Students Union. As Nohara Shirõ notes : “Subsequently, at a joint preparatory meeting for the 'May 30 Petition Movement" Huang clashed bitterly with the General Secretary of the Beijing Students' Union Zhang Guotao over the advisability of such a movement. He and his supporters' position - that even though it would not achieve much in itself such a movement would effectively expose Premier Duan Qirui's collusion with the Japanese, prevent direct Sino-Japanese negotiations on the Shandong question, and awaken the entire people to the situation -eventually triumphed.” Huang was then known as Huang Zhengpin. He argued at the meeting that the petition march go ahead “regardless of the consequences”. Huang was imprisoned twice during the wave of agitation. Pang Renquan was from Xiangtan also in Hunan and had studied at the Jiazhong School alongside Huang Ai. It should be noted that Pang was born only 30 or 40 li from the birthplace of Mao and it was this that may have initiated their first acquaintance. He was involved in the Expel Zhang Jingyao movement in summer 1919 that mobilised against the murderous warlord Zhang Jingyao, “Zhang the Venomous”. According to the myth-maker Li Rui he “had placed a great deal of trust in Mao”, also involved in this movement. In early 1920 Huang returned to Changsha. He and Pang worked in the local factories where it is asserted that they came in contact with local anarchists, although Huang had already been exposed to anarchist ideas whilst in Tianjin. They set up a workers’ reading society which then on November 20th of that year became the Hunan laogonghui (Hunan Worker's Union). The founding meeting was attended by representatives from the guilds among the printers, tailors, mechanics, foundry workers, dyers, miners, surveyors, rattan and pottery workers. However most of the original members were students at the Jiazhong School, the First Vocational School and the Chuyi Industrial School. At its start the union was very much under the influence of local merchants via the union executive and as a result a struggle for influence over the union had to be fought by the anarchists. Membership was offered to “all those who work with machinery or in the handicraft industry or those who have industrial training” “whether they be male or female” after being introduced by two members. Gradually influence began spreading further than the original circle of students with workers joining from the No1 Cotton Mill, the graphite refining plant, the local mint, masons and carpenters, and tailors and barbers. Three members made up a union cell. In the beginning the union did not set a section up in each industry or hold any cell meetings but this began to change with the strike at No1 Cotton Mill. Their paper Laogong (Worker) was set up, running from January to October 1921. 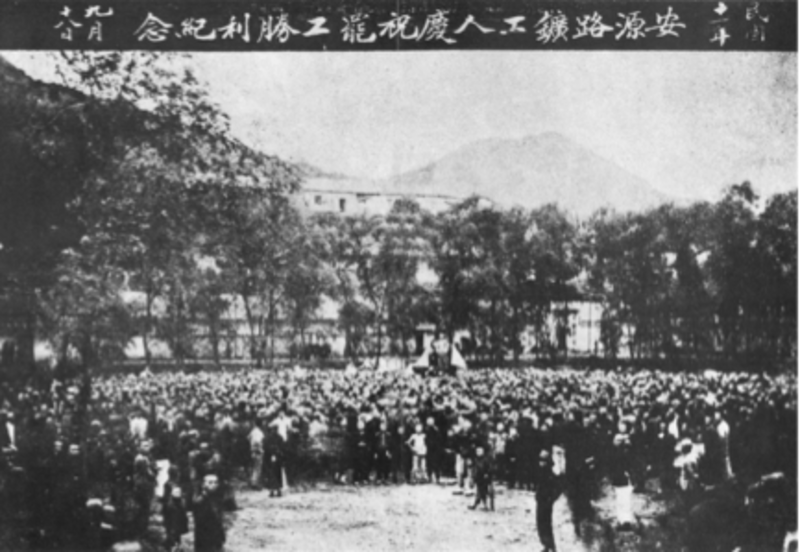 It did not advocate general strike action and reflected moderate views but its successor from October Laogong zhoukan (Worker's Weekly), was now firmly under anarchist control and called for much stronger action. Because of its radical outlook, it had to be distributed secretly. As Laogong Zhoukan stated: “In the past, the enemy called for a conditional compromise with this union, but this union did not accept. This is because we know very well that there is no room for compromise between the working class and the capitalist class”. The strike movement at the No 1 Mill galvanised the union. At first the mill-owners, organised as the China Realty Company, had bought off the struggle. They even offered Huang and Pang a large sum of money to desist, but this bribe was sternly rejected by them. The pay and conditions at the mill were appalling with ten people sleeping to a room and a lack of toilets, poor food and beatings of workers. Several workers died at work because they were too afraid to ask for sick leave. In April 1921, the union mobilised 2,000 workers at the mill in a demonstration. This forced the boss of the Realty Company to cross the river and negotiate. He was forced to sign an “oath” that he would no longer lease out No 1 to local capitalists. The Realty Co. called on the aid of the new local warlord Zhao Hengti, who himself had considerable shares in the Mill. Huang was arrested by him and spent more than a month in jail, where he began a hunger strike. Only later, after Zhao sent in armed troops was the Realty Co. able to restart operations at the Mill. Though few of the demands were won, this was probably the first time that organised workers in China had won any such demands. As a result the union grew to 4-5,000 members. It was the anarchists who led the way on this, and no amount of rewriting history can conceal the fact that Marxists all over China were up to then concerned above all with education and theoretical study. Mao Zedong was one of those who now began to relate to this nascent workers movement. He was located in Changsha and had helped set up a Cultural Book Society there. The anarchists in the union were highly critical of the Marxist attitude towards government, referring to them as “long tails”, saying that since they wanted government there was little difference between them and the warlords. It seems rather disingenuous of Li Rui to say that “Mao encouraged Huang and Pang to resist the capitalists, to resist Zhao Hengti and to launch a labour movement” and that “he criticised them for talking only about labour unions and not studying Marxism”. Mao was forced to relate to this movement, and as Pantsov notes “Understanding that he could not possibly compete with such an influential union, Mao did the only sensible thing under the circumstances: he tried to win over Huang and Pang to his side.” He wrote an article for Laogong Zhoukan at the end of November 1921, My Hopes for the Workers’ Union, where he said that he had sympathised with the union for a year already, finishing by saying that the purpose of the union was not just better pay and shorter working hours, but “should also nurture class consciousness so as to unite the whole class and seek the basic interests of the working class”. The fact that this was something glaringly obvious to Huang, Pang and the other anarchists does not seem to have entered his head! Mao accompanied Huang and Pang to Anyuan in Jiangxi province where they posed as “observers” and visited the mines, factories and the railroad machine plant there and talked with workers, with the long term aim of organising there. At the end of 1921 the Workers’ Union was involved in agitation about securing year-end bonuses for workers in different industries to offset wage reductions and non-payment of wages. A strike broke out at No 1 Mill in January 1922 where workers demanded an extra month’s pay. The mill owners called in their security thugs and two workers were killed. This did not deter the strikers and once again Zhao’s armed thugs were called in, with Zhao receiving a bribe of 50,000 yuan from the Realty Company. During the night of January 16th, Huang and Pang were at a union meeting to discuss how to deal with the Realty Company, when Zhao’s troops burst in and arrested them. They were secretly taken to the Liu-yang Gate on the morning of the 17th January and beheaded. “Fresh blood dyed the freshly fallen snow”. Zhao subsequently closed down both the union and its paper. After their murder Zhao cooked up charges against them of “buying firearms, colluding with bandits, and agitating for a strike at the mint at the end of the year when any stoppage of work was simply out of the question, as the copper money to be coined in the mint was required for the soldiers’ pay and rations”. In the afternoon there was a work stoppage in the various Changsha workplaces and village after village was filled with people coming out on the streets. The Domestic Affairs Commission and the Finance Commission were broken into. Two protest meetings (“under the personal sponsorship of Mao”- does this mean he organised these or rather that he attended the meetings?) were held at the Wang Fuzhi Study Society (which also put out a special memorial publication) and on January 27th a public burial of Huang and Pang took place. Though the bonus was won, conditions remained appalling at the Mill and Zhao and the mill-owners had smashed the organisation of the workers. After the murders, many of the anarchists involved in the union fled. The anarchist labour organiser Zhou Dunhu, a close associate of Huang and Pang, fled to Shanghai, where she became involved in the activities of the Anarchist Federation there. Other important members of the union appear to have later joined the Communist Party, among them Jian Chuping (murdered 1928) and Pang Renqian, the older brother of Pang Renquan (murdered 1927). Interviewed in June 1963, the old warlord Zhao Hengti “recalled with considerable glee” that he had “killed a couple of fellows called Huang and Pang”. After their murder it was claimed by the Communist Party that Huang and Pang had joined the Socialist Youth Corps just two months before their deaths, under the influence and inspiration of Mao. Stuart R. Schram, in his introduction to the Li Rui book is very sceptical about this, further citing the French historian Jean Chesneaux who he says “in his pathbreaking work on the Chinese labour movement shows considerable scepticism about this”. Mao had organised the Socialist Youth Corps in Hunan since 1920 but this was far from being an orthodox appendage of the Party, and contained disparate elements. Indeed, the Chinese Communist Party di not as a whole fully take on board the Leninist idea of organisation until 1922 and “did not understand it fully and implement it effectively until well after that” (Schram). Was it really true, according to Li Rui, that “The change in attitude of Huang Ai, Pang Renquan and by the masses of the labour union after having been educated and won over by Comrade Mao Zedong was the victory of Marxism over anarchism”?